Hingham pulled out all the stops in preparation for its 300th anniversary celebration. Twelve hundred of the Town’s residents participated in a three-plus hour historical pageant, which was performed before 2,000 attendees on the evenings of June 27, 28, and 29, 1935. In the midst of the Great Depression, the Town appropriated an astonishing $14,000 for its tercentenary observance, which was written and directed by Percy Jewett Burrell, a well-known producer of such extravangas. Reunions of Hingham’s oldest families were held, the Boy Scouts gave tours of Town buildings, and the Hingham Historical Society put on a special Historic House Tour to mark the occasion. “The Pageant of Hingham” was performed on a sprawling outdoor set at what was then called Huit’s Cove (current site of the Shipyard development) and comprised ten “episodes,” interspersed with music and dance. The episodes portrayed key moments in Hingham’s history, including the “landing” at Bare Cove, the Rev. Peter Hobart’s dispute with Gov. John Winthrop, an early Town Meeting, receipt of the Town Deed from the Wampanoag, the erection of Old Ship Church, a Colonial “husking” bee, the Battle of Grape Island, Madam Derby’s bequest to found Derby Academy, the ordination of the Rev. Henry Ware, and the Civil War. We were recently fortunate enough to receive the donation of a costume that a 12-year old Hingham boy wore as a pageant participant: breeches, jacket, hat, and shoe buckles. Who would have imagined that the costumes were this brightly colored? Certainly the black and white photographs of the Pageant that we have posted elsewhere provide no hint. Here, there is peace, as onward Hingham moves. What was in early days a wilderness is now a fruitful place. The hills, the plains, the streams, and vales lie quiet . . . . It is a mid-century year—an August month, and beautiful is the harvest . . . .
Perez Cushing (shouting): “Here they come from Scituate! The Jacobs, Farrars, Curtises, and Faunces! It must have been a memorable several evenings for a school-age boy to have performed in this Pageant before the Town and many visitors. The addition of this purple Pageant costume to our collection makes it all seem a little more real to us today. 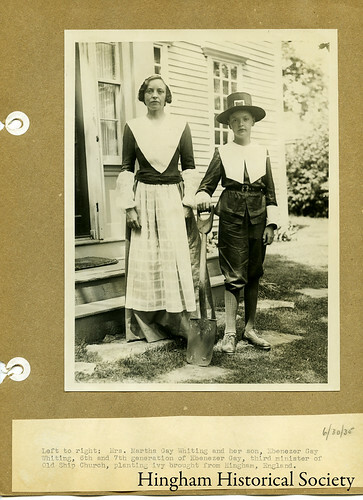 Ebenezer Gay Whiting, another young Hingham participant, with his mother, in costume for the Tercentenary Pageant. This entry was posted in Uncategorized and tagged children, costumes, Hingham, Hingham Historical Society, music, pageants, recreation.